Before stepping onto the field, get your head around the game. 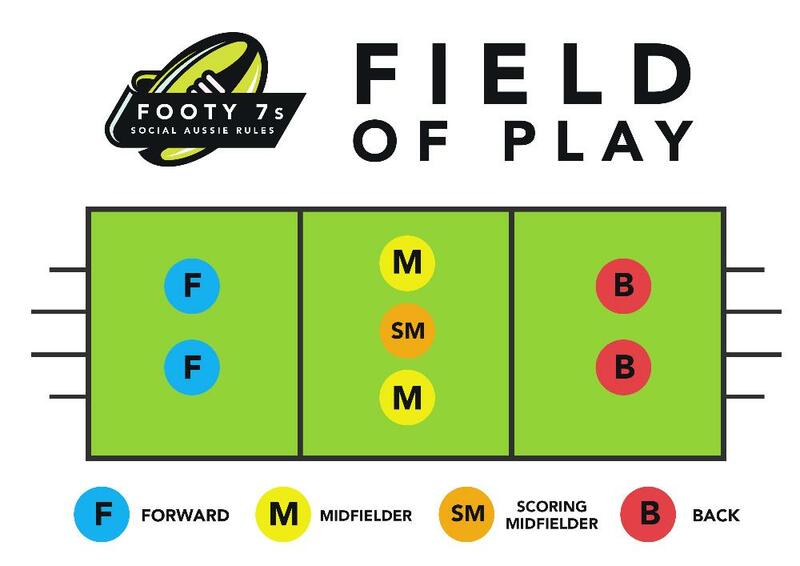 1.1 Footy 7s is divided into three zones – Forward, Midfield & Defence. 2.1 Matches consist of 2 x 16-minute halves. 2.2 There will be a one minute break at half-time. 3.1 A maximum of 7 players are permitted on the field at any one time. 3.2 A team consists of 2 forwards, 3 midfielders (one of whom can score) and 2 backs. 3.3 Mixed teams must have a minimum of 3 females on the field at any one time. In the case of 6 or less players a team must have a minimum of 2 females. 3.4 A team is permitted to have an unlimited number of players on the interchange bench. Interchange of players is permitted at any time during the game. 3.5 Players are only permitted to play for one team in a Men's, Mixed or Women's competition on any particular competition night. 3.6 Teams found to be playing ineligible players relating to rule 3.5 may lose match points. 3.7 For all Footy 7s senior competitions, players must be a minimum of 15 years of age to participate. It is the responsibility of each team to ensure this rule is enforced at all times. 4.1 The game is commenced with a ball up in the midfield zone between two centre players standing toe to toe. This occurs at the start of each half and after a goal has been scored. 4.2 The centre players contesting the ball up must tap or palm the ball backwards, when the ball is on the way down. Punching and taking possession of the ball are not permitted. 4.3 The remaining centre players stand a minimum of 2 metres away from the ruck contest on the defensive side of the ball up. 4.4 The player who wins possession from the ruck contest has a maximum of 2 seconds to dispose of the ball. 4.5 Players must start in their designated zone after a goal has been scored. 4.6 A kick in between the goal posts occurs after a behind has been scored. The opposition player must be a minimum 5 metres back from the player kicking in. The ball must be kicked from within the goalposts. 5.1 The ball must be disposed of correctly by handball or kick in each zone for a goal scoring opportunity to occur. 5.2 The kick in after a behind is only permitted to enter the defensive zone. 5.3 The minimum distance for a mark to occur is a 5-metre kick. If it is under 5 metres, a call of ‘play on’ occurs. 5.4 A player is only permitted to bounce the ball once while they are in possession of the ball. The ball must be bounced once after 15 metres. 5.5 If the ball is kicked or handballed over two-thirds, a free kick will be awarded to the appropriate team on their defensive third line. 6.2 If a turnover occurs, the opposing team takes possession of the ball where the ball first touched the ground, went out of bounds or where the player was caught in possession. 6.3 The nearest player to where the turnover occurs must take possession of the ball. They can dispose by hand or foot if the turnover occurred on field. For out-of-bounds, the ball must be disposed by kick only. 6.4 The ball must be kicked in from out of bounds. A shot for goal is not permitted. 6.5 A ball up occurs if there is any doubt as to which team caused the turnover. 7.1 A player must be caught 'holding the ball' by the 'two handed touch' method. No tackling, bumping or barging is permitted. 7.2 If a player is deemed to have had prior opportunity to dispose of the ball, this is considered 'holding the ball' and a turnover occurs. 7.3 If a player is considered to have had no prior opportunity to dispose of the ball the umpire calls ‘Touch’ and the player has 2 seconds to dispose of the ball. If the player is unsuccessful in disposing of the ball after this opportunity, a free kick will be awarded. 8.1 A ‘mark’ is awarded if a player controls the ball after it has been kicked a minimum 5 metres without getting touched by another player or hitting the ground. 8.2 There is no type of physical contact permitted in a marking contest. The player in front has every chance to mark the ball. A free kick is awarded against any player initiating contact. 8.3 An opposition player may stand on ‘the mark’. This is the place where a mark or free kick has been awarded. 8.4 The umpire will call ‘play on’ if it is deemed the player has had reasonable opportunity to dispose of the ball. 9.2 The umpire is permitted to call ‘advantage’ if the player in possession of the ball initiates the advantage. 10.2 The two designated forwards and scoring midfielder are the only players able to score. These players are identified by wearing a coloured sash. A score can only occur through taking a mark, receiving a kick or hand-pass or when they are awarded a free kick. 10.3 A scoring player is able to score if they are awarded a 15 metre penalty which takes them into the scoring zone. 10.4 A goal or behind can still be awarded if the ball touches the ground directly from a shot at goal by a scoring player. If the ball is touched following the shot at goal, a standard turnover occurs from where the ball was touched. If the ball is touched as a kick is made at goal, a point will be awarded opposed to a turnover if the ball crosses the goal-line. 10.5 A team is not able to score directly from out of bounds or from a turnover. 10.6 A team is only able to score inside the forward zone. 11.6 A forfeit will result in a 60-0 win awarded to the opposition. Please note, multiple forfeits may result in removal from the competition. 12.1 Players may interchange at any time without notifying the umpire. A player must leave the field before the substitution may replace them. 12.3 In the case of a player being sent-off, the player is not permitted to return for the remainder of the game. After two minutes of the player being sent-off, the team may then replace them with another player. 14.3 Finals format will consist of the top 2 teams playing off in the grand final with all other teams playing placing playoff games to ensure every team gets a game on finals night. 14.4 Final ladder positions are determined by total game points. In the case of teams having equal points, higher percentage will take precedence. If still equal, higher points for will take precedence. 14.6 In the case of divisions with uneven bye allocation, points will be averaged to determine final ladder positions. (i.e. A team with 1 bye and 30 points from 15 matches (2 points per match) will finish higher than a team with 2 byes and 31 points from 16 matches (1.94 points per match). 15.2 Any physical contact will result in a free kick awarded to the relevant team. 16.2 In the case of a yellow card offence, a player is sent off for 2 minutes. The player can be replaced immediately. A 2nd yellow card offence in a game is an automatic 1 match suspension. 16.3 In the case of a red card offence, a player is sent off for the rest of the game and receives a minimum 1 match suspension. The player can be replaced after 2 minutes. 17.1 It is assumed games will go ahead in all weather conditions unless decided otherwise by the Venue Manager on the night. In the rare case of a full night cancellation, a message will be sent to all teams prior to the night commencing. 17.2 In the event of a full night cancellation due to weather, all games will be recorded as a 30-30 draw. 17.3 In the case of an in-game cancellation, a result will stand if more than 50% of the game has been played. If less than 50% of the game is played, a 30-30 draw will be recorded. - Players must demonstrate respect for umpires, other players, spectators and staff. Any breach of the above standards will result in an official warning or immediate dismissal from the competition. Anti-social behavior, both on and off field, will not be tolerated. Please note that banned players are not permitted to play for any team or enter the venue during competition. When a player is involved in a discipline issue, Social Sport will decide the length of suspension. In the case of a serious incident, a player may receive an extended suspension or be banned from the competition. The Competition Manager will confirm suspension details (including additional weeks) to the team contact prior to the next round of the competition.